Dr. Ward transferred ISVG to its new home at the University of New Haven in 2008 and initiated the first dissemination of the database results, which took the name of the Violent Extremism Knowledge Base (VKB) in 2011. 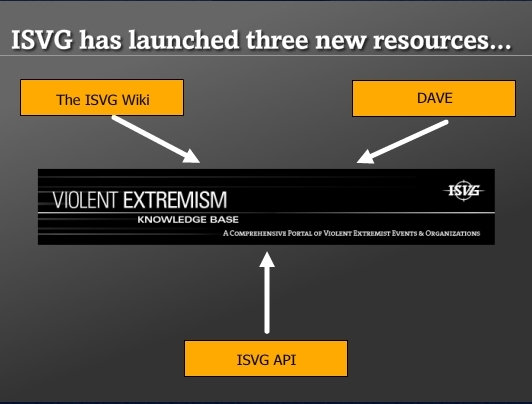 The ISVG database is organized with the purpose of capturing and recording 1,500 diverse variables associated with groups, individuals, and events that are linked with radical violent crime and extremism around the globe. After 10 years of diligent research, the database now contains over 223,000 incidents that have involved about 43,000 individuals – with links to about 3,000 different organizations. ISVG communicates this information through “advanced visualization and analytic products,” with the intention of aiding those that are empowered to make important decisions on terrorism and global crime. Link and network association charts – provide insights into a region such as discovering connections between actors, the existence of new groups, the dissolution of known alliances, and shared participation in attacks. 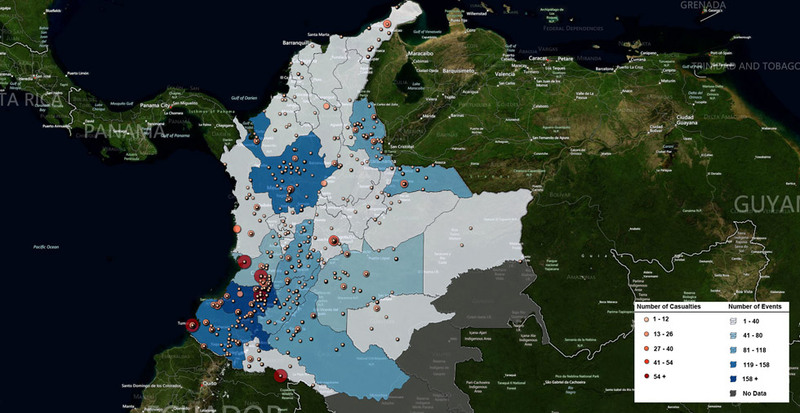 Event data is geospatially enabled – georeferencing allows information to be used in visualizations that can uncover new hot spots of activity, trends in attack locations, and the growth of violence across regions over time. Data can also be imported into existing geospatial environments as dynamic data layers. 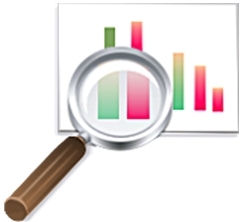 Information is temporally tagged – data to be exported and used to create detailed timelines of activity, statistical graphs that are used to expose trends over time, and to examine the activity levels within a region over periods of time. The research of ISVG involves manually sifting through information gained from web sites, journals that are available online, social media, governmental publications, and other traditional open source media that is accessible worldwide. Highly competent researchers, fluent in a multiplicity of languages, merge the compiled data into analytic visualizations for presentation to the public and specific “clients” positioned within governmental organization and interagency homeland security. ISVG prides itself on a “three-tiered quality control process,” dedicated to “transparency, accuracy, and accountability from the researchers, database content, and analytic products.” Data acquisition and synthesis are an ongoing concern of ISVG projects located across the United States, involving interaction with multiple government and private agencies vested in the maintenance of national security. The website for ISVG offers a search function by which any interested person can review the profiles of violent radical groups – by geographic region, significant acts of crime and terror, or notable personages. Likewise, the ISVG blog offers interesting and frequent “links of the day” pulled from “hundreds of open-source news and intelligence articles from around the globe.” Visitors to the website can also access colorful and informative visualizations that offer interactive features by clicking on “data points” within the graphic. The existence and easy availability of ISVG is an obvious indication that violent extremism has become a global problem of vital concern. Although terrorism is not a newcomer to the history of civilization, recent advancements in technology have made it a menace that must be tracked more carefully than in past centuries. The events of 911 are an obvious indication of this fact, involving aviation, cell phones, international crime, transnational financing, and subsequent mass destruction. ISVG offers the advancement in sophistication required to meet these threats, which in time could involve extremist groups capable of venting nuclear destruction on large metropolitan areas. Proactive measures such as those offered by ISVG are crucial to meeting this fanaticism head-on and before the fact, rather than suffering an immense tragedy that makes 911 pale in comparison. The video below is offered as additional information for those accessing this article, but we also ask that you please click on the link below and sign the petition to which this website is dedicated. You can help promote the establishment of a monument dedicated to all American victims of terrorism, whether they died at home or abroad, by clicking the link above and signing the petition. Nothing is asked but your signature for a good cause. On October 2, 2001, scarcely one month after the horrors of 911, Representative Jim Turner of Texas introduced H. R. 2982 to the House of Representatives, calling for “the establishment of a memorial to victims who died as a result of terrorist acts against the United States or its people, at home or abroad.” The resolution was amended by the Committee on Resources in June of 2002 and eventually approved on September 25, 2002 on a “motion to suspend the rules and pass the bill.” It was sent to the Senate Committee on Energy and Natural Resources, but it has languished there ever since – in effect dead and going nowhere. In 2008, this Senate Committee considered making Dark Elegy, the work of a New York sculptor who lost a son in the bombing of Pan Am flight 103 over Lockerbie, Scotland, as the monument called for in H. R. 2982. However, the committee turned down the touching and thought-provoking sculptures of Suse Ellen Lowenstein – on the grounds that “…as compelling and impressive a proposal as has been made for the memorial in question, that we believe that, for the time being, that it relates to a very specific incident and should be treated as such rather than as a generic monument to victims of terrorism for all time.” Today the resolution seems forgotten, and it is the purpose of this website to promote a petition to the House of Representatives and the Senate Committee on Energy and Natural Resources, requesting that H. R. 2982 be reconsidered and revisited. This entry was posted in Posts for the Cause and tagged Bureau of Justice Assistance, Institute for the study of violent groups, intelligence reform and terrorism prevention act, memorials, monuments to the fallen, monuments to victims of terrorism, peace, Sam Houston State University, terrorism, terroristic violence, United States Department of Justice, University of New Haven. Bookmark the permalink. What Happened to H. R. 2982?